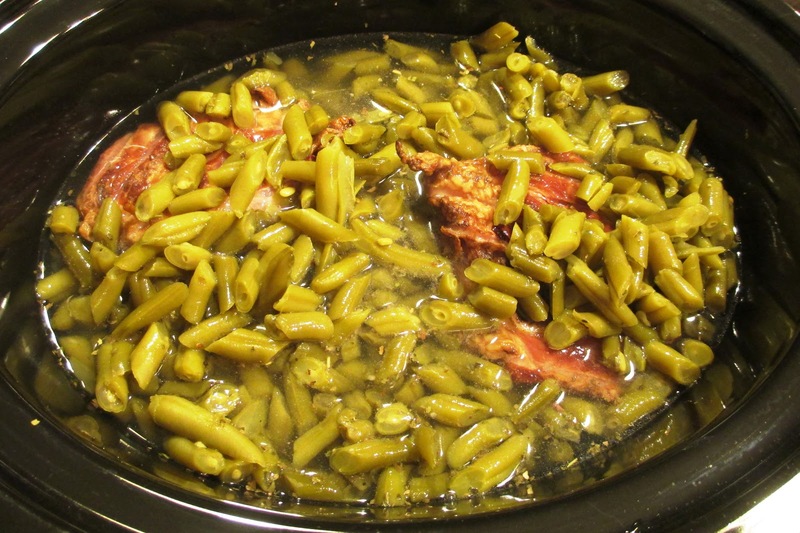 I made some easy & yummy green beans for our Easter potluck, so I thought I'd share with ya'll. Definitely enough to share. Enjoy! 2) Add water to fill to the top of the bean level. I know this sounds ridiculous, since you just drained all the beans, but all my cooking advisors swear it helps them taste more fresh and less canned. 3) Add ham shank.Or ham hock. I hear ham hock is better, but I can never find it in my grocery, so I use ham shank and I've gotten no complaints. 4) Add Italian seasoning. Stir. Add more Italian seasoning. Stir. Add more Italian seasoning. Stir. Add more Italian seasoning. Stir. 5) Cook on low for 8-10 hours. After about four hours I like to go in and "shred" the ham shank as much as it will let me. Do that again at six and eight hour marks. Spread the ham love. Or just wait till their done. No harm, no foul. 6) Don't forget your serving spoon with the slat-thingies so water can drain thru. Yum! I'm going to try this (and I had no idea that cooking beans in water rather than the juice they come packed in would make them taste better).